Modern vehicles are very reliable but they do require regular maintenance and servicing if you want to avoid expensive breakdown repair work. Regular vehicle maintenance is extremely important in getting maximum life from your vehicle. Contact us for straightforward advice on saving money by servicing your vehicle regularly. You get auto dealership expertise without the dealership auto repair price. Automotive Solutions Greerton is an independent, full service auto repair shop. We work on all makes and models, import, domestic vehicles and carry out Warrant of Fitness for all light vehicles, motorcycles, caravans and trailers. Our certified auto repair technicians use the latest auto repair technology and are equipped to perform all major and minor repairs. Owner Shayne Gregg and his friendly employees use the latest diagnostic equipment to guarantee your vehicle is repaired and serviced correctly and quickly. 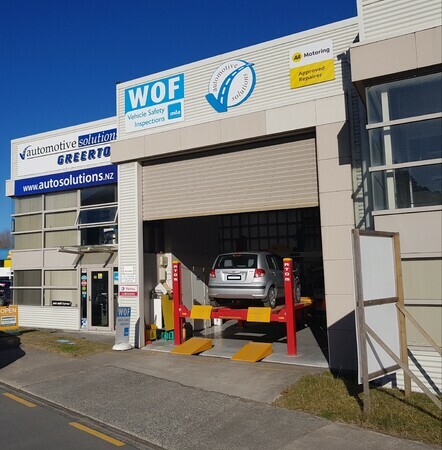 Automotive Solutions Greerton is a fully equipped four-bay full-service automotive repair shop which allows for quick, high quality auto repairs and preventative maintenance to everything from the latest vehicles to your prized classic vehicle. Meet Shayne.....he owns Automotive Solutions Greerton. The price of fuel is a hot topic and Shayne has a solution....HHO carbon cleaning will improve fuel economy.... like this post and save 10% on a vehicle detox from him and enjoy the savings there after. Shayne also has the latest brake, suspension and alignment machine which he uses for accurate WOF testing. When you jump on the brakes you want the car to stop quickly, safely and in a straight line. The last thing we want is the vehicle pulling to one side from unbalanced brakes or a weak shock absorber making the car dive on one corner causing it to possibly spin or slide. A WOF is an important safety check as we only get one go on this planet and this equipment is made to make an accident less likely. Thanks Shayne for your business ...This is a well equipped shop, nothing is a short cut! !....proud to be your supplier of choice. Most consumers, do not realise that they have the right to choose who services their vehicle. Consumer law was updated in 2010 to reflect that their manufacturer's warranty will not void if they take their vehicle somewhere else.